February 16, 2018―The Lexus mission to create a better world through design and to support imagination and creativity reached another milestone today with the brand's announcement of its "LIMITLESS CO-EXISTENCE" event. This marks the luxury automaker's 11th appearance at the esteemed Milan Design Week. Visitors to the event will engage in imaginative and thought-provoking design that contemplates a limitless future for society. Lexus sees design as a catalyst for continuous change, for empowerment and for inclusiveness. Design can transform the ordinary into the extraordinary, and reveal to humanity that, with "CO-", as in cooperation, collaboration and coexistence―our possibilities are limitless. The event's sensational main installation created by Japanese architect Sota Ichikawa of doubleNegatives Architecture brings visitors face-to-face with "CO-" represented in a dynamic artwork existing in four dimensions. Ichikawa, known for combining information technology with design to re-imagine the physical space, creates an installation that intersects digital and analog. Built on an imaginative ideology that everyone is the center of the world, a visually infinite number of hanging vertical strings are used to represent the world's individuals. Each hanging vertical string is simultaneously illuminated by a single light source and yet not one is in the shadows; a representation that each individual perspective is its own center. Through the use of technology and innovative design thinking, the seemingly impossible is achieved. 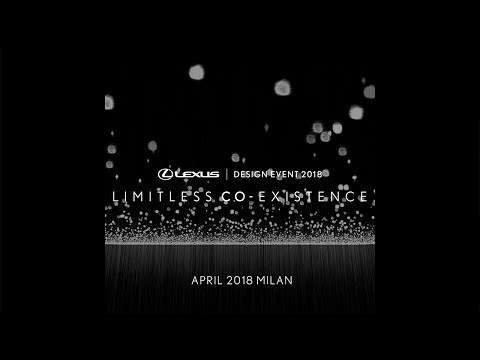 Lexus' passion for design has fueled the growing appeal of the brand in recent years and in Milan, Lexus will be showcasing its newest concept - the innovative Lexus LF-1 Limitless that hints at future design thinking from Lexus. The Lexus Design Event can be experienced in the newly restored Cavallerizze in Museo Nazionale della Scienza e della Tecnologia Leonardo da Vinci. This one-time monastery and horse stables from the 19th century underwent a recent restoration as part of an architectural recovery and urban redevelopment project. To further excite guests, a unique culinary experience has been created by the trio of innovative young chefs that are Milan's ALTATTO. They will hone the senses through taste and vision, transporting LIMITLESS CO-EXISTENCE into another dimension. In addition, visitors will have the opportunity to view the works from the 12 Finalists from the 2018 Lexus Design Award which celebrates up and coming creative talent from around the world and on the Press Day of April 16th, the Grand Prix winner will be chosen by the world renowned Jury in front of the world's media. Japanese architect Sota Ichikawa of dNA (doubleNegatives Architecture) believes that architecture's potential is restricted by conventional methods of measuring space. By programming computers to interpret space from an omnidirectional perspective, he frees his imagination to explore new dimensions. Ichikawa's awards include the Algorithmic Design Quest (ALGODeQC) Architecture Vanguard Prize and ALGODeQC Programming Vanguard Prize, an ARS Electronica 05 and 09 Honorary Mentions, and the Wonders in Annual Development and Architecture Award (WADA). As a key contributor, Takatoshi Arai, a member of hclab. supports this project. Ichikawa is also a member of hclab., the urban research and design group. The Altatto catering service uses fine Italian produce to create vegetarian and vegan cuisine that values the environment, manual work, seasonality and tradition. Altatto comprises three cooks―Giulia Scialanga, Sara Nicolosi and Cinzia De Lauri―pursuing flavor and beauty as an expression of their skills and passion. They met at Joia, the only starred vegetarian restaurant in Italy, and have deepened their understanding and technique under the guidance of Pietro Leemann, Joia's founder.